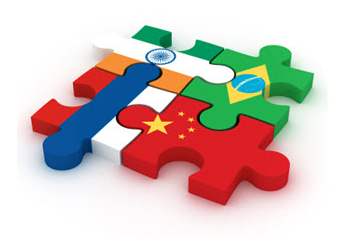 The BRIC (Brazil, Russia, India and China) countries have seen significant growth over the last decade since the group of countries were defined as emerging markets in 2001. But a new group of emerging markets collectively known as the MINTs (Mexico, Indonesia, Nigeria, Turkey) are about to take over as the global investment hubs for the manufacturing sector. Brazil is currently experiencing significant growth in its manufacturing industry thanks in part to high import taxation laws imposed by the government. These laws were introduced to try and encourage companies to manufacture goods in Brazil rather than import them into the country. The government policy of high import taxes has worked, especially as far as the automotive industry is concerned and the high tech industry is growing quickly as well. In fact I would argue that next to China, Brazil is seeing more inward investment, from a manufacturing investment point of view, than many other countries at the moment. Whether it is to take advantage of a growing economy or leverage the country as a stepping stone into the North American market, you cannot deny that Brazil is on a roll at the moment. Russia has also seen significant growth over the past decade, thanks in part to a reduction in government imposed restrictions and red tape. Traditionally many companies have chosen markets other than Russia to invest in but those that have taken the plunge and invested in Russia have seen huge growth in their own market share. The automotive industry is a prime example, many Russian car plants look as though they have just come out of the stone age due to tight government control and lack of investment, but St Petersburg Port has become an unlikely investment hub for the global automotive industry. Renault-Nissan made a significant investment in the government controlled automotive manufacturer Avtovaz, which has resulted in the alliance controlling a significant market share. Like a Phoenix, the whole automotive industry in Russia is now rising from the ashes and it is just a matter of time before millions of consumers start to spend their money on new cars. Moving across to India, the country is still seeing significant growth in its economy, thanks in part to a decade of setting up one of the world’s largest markets for outsourcing companies to invest in and it has become the offshoring destination of choice for many companies around the world. Consumer wealth in India is growing significantly and many consumers are making the switch from two and three wheeled vehicles to cars. India’s manufacturing industry has grown around its ability to produce high quality goods from a relatively low cost but highly skilled workforce. Most goods manufactured in India are for export but increased consumer wealth is likely to slow down the rate of export as manufactured goods are sold into the domestic market instead. So some interesting dynamics at play here which has helped companies such as Tata invest in overseas luxury brands such as Jaguar Land Rover (JLR). In fact in 2013 JLR sold more cars than any previous year thanks in part to the significant investment from Tata who has a strong belief in the future of the luxury brand. Ten years on and China is still referred as an emerging market by some analysts but out of the four countries China has seen the largest growth in its economy when compared to the other three countries. As consumer wealth has grown in the country, so has the consumer desire for luxury goods such as cars. In fact China is the largest car market in the world and it continues to grow. Strict government laws, namely establishing joint manufacturing ventures, around how western companies can establish a presence in the country, has helped its own domestic manufacturing industry to flourish. However times are changing in China as the government tries desperately to spread the wealth across the country rather than have it all focused along the East Coast. Large tax based incentives are now seeing more western investment in central and western China and this trend is likely to grow over the next ten years. Today, companies are finding they have a choice, either to put up with the increasing wage rises in Eastern China or move their operations to lower cost regions of the country. In some cases companies, even Chinese ones, are looking at other emerging markets around the world to invest in. Increased wage costs, labour strikes and a desire to exploit other growing markets has led to the emergence of a new wave of emerging economies, thirteen years after the BRICs were defined. Hold on tight, the second wave of emerging markets is vying for inward investment, say hello to the MINT countries! This new acronym refers to Mexico, Indonesia, Nigeria and Turkey and was coined by Jim O’Neill, the former chief economist and head of asset management at Goldman Sachs. Interestingly Jim was also credited with introducing the BRIC term back in 2001, so you could say he has expertise in identifying key growth economies around the world. So let me now explore why these countries are likely to take over from the BRICs as the economic growth engine of the world. One of the common things that three of the MINT countries share is that they all have geographical positions that should be an advantage as patterns of world trade change. For example, Mexico is next door to the US and also Latin America. Indonesia is in the heart of South East Asia but also has strong connections with China. 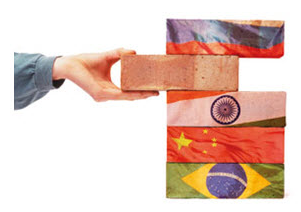 The BRIC countries have certainly helped boost the profits of many logistics providers around the World as they ship manufactured goods from China and India to all corners of the world. Given that the MINT countries are geographically better positioned next to key economies then I would expect the dynamics of the logistics industry to change given the shorter distances that goods will have to be shipped to reach their point of distribution or sale. As for Turkey it can be regarded as being in both the West and East however Nigeria is the odd one out here as it is located in a part fo the World that has traditionally seen little development, at least by Western standards but it could be a key country once other countries stop fighting with each other and trade finally opens up across the Continent. Given that Nigeria has been included in the MINT definition it could lead to the country being accepted as a member of the G20 as the other three countries are already members. 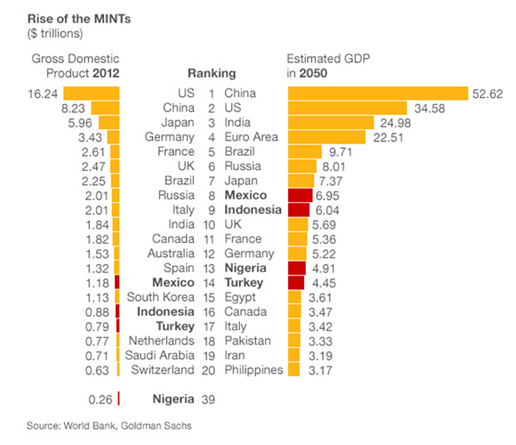 Economically three MINT countries, Mexico, Indonesia and Nigeria are commodity producers and only Turkey isn’t. This contrasts with the BRICs where two, Brazil and Russia are commodity producers and the other two countries aren’t. In terms of wealth, Mexico and Turkey are at about the same level $10,000 per head, this compares with $3,500 per head in Indonesia and $1,500 per head in Nigeria which is roughly the same as India. They are slightly behind Russia at $14,000 per head and Brazil on $11,300 but still a bit ahead of China on $6,000. As part of the research for this blog I found a great set of infographics which dives deeper into each of the MINT countries, click here for the article. From an infrastructure point of view, these countries have some significant catching up to do, especially in Indonesia and Nigeria. Jim O’Neill recently completed a trip to each of the MINT countries on behalf of the BBC and he found out some amazing facts. One of the most interesting was that about 170million people in Nigeria share the same amount of power that is used by about 1.5million people in the UK. Almost every business has to generate its own power. So this begs the question, how has Nigeria grown at a rate of 7% with literally zero power! If Nigeria is able to sort out its utilities infrastructure then it is estimated that Nigeria could grow at 10-12% per year and become a key economic hub for the African continent. Indonesia faces both political and infrastructure challenges and Turkey has its politics and a desire to do things the Western way which when combined with the Muslim faith in the country is certainly a challenge but they are determined to see their economies grow over the next decade. It is no surprise that Turkish Airlines is currently the fastest growing airline in the world. From a manufacturing point of view, Mexico is grabbing most of the MINT related headlines in terms of levels of manufacturing inward investment. Over the past two years it has established itself as a key automotive manufacturing hub, thanks in part to its relative proximity to the huge North American market and significantly reduced labour rates. Nissan, Daimler and VW have all announced multi-billion dollar investments in new production plants in the country. Indonesia is seeing significant investment from both Western and Chinese companies looking to get out of the increasingly more expensive Chinese labour market. Just as Mexico stands to become a leading automotive hub, then it is possible that Indonesia could become a leading high-tech investment hub over the next decade. High Tech goods have been manufactured in Indonesia for many years but I would expect exponential growth to now continue given that the country has now been identified as a significant growth economy. From a B2B perspective it has been interesting to watch how technology has been adopted across the BRIC countries in recent years as it provides clues on B2B adoption levels across the MINT countries. Out of all the BRIC countries and from a communications point of view, China has placed a lot of emphasis on improving its legacy telecommunications and network infrastructure. It has also been keen to develop its own XML based message standards due to the increasing importance placed on internet based trade around the world. However what has actually happened over time is that Western companies entering the Chinese market have brought in their Western ways of working and this includes their best practices for deploying B2B, ERP and other IT infrastructures that are key to operating a business today. Also, China has huge global expansion plans and if they are to establish further operations in North America and Europe they will have to adopt Western B2B message and communications standards such as EDIFACT and AS2. For this reason I believe that EDI messaging is here to stay and in fact the growing success of the emerging markets and their global expansion plans could lead to a growth in EDI traffic around the world. Who thought that would happen back in 2000 when XML was touted as the replacement for EDI messaging! Since the BRICs were identified as growth economies in 2001, technology has moved on very quickly and I think we will see the MINT countries move straight to new telecommunications infrastructures such as mobile networks. After all reliable, fixed line internet connectivity is not widely available in many of the MINT countries. Given that it is far quicker to install a mobile network when compared to a fixed line telecommunications infrastructure then I would expect mobile commerce or M-Commerce to grow faster in the MINT countries than the BRIC countries over the next few years. Here is a great SlideShare presentation that I found highlighting how a local telco provider, Vodacom, plans to support the mobile communications market in Nigeria, click here for more information. China will probably be implementing more mobile networks across the Western parts of its country but collectively I think mobile network adoption will be faster across the MINTs. If companies are able to get access to reliable mobile and utilities infrastructures then we will see levels of B2B adoption increase quickly as the MINTs look to utilise more cloud based B2B integration services. Given the relatively low IT skills that exist in some MINT countries, a cloud based approach to rolling out B2B infrastructures will help these countries grow their economies far more quickly than the BRICs were able to achieve in their early days on the world stage. International expansion is an area that I have covered in numerous blog posts over the past few years, but this particular one encapsulates most of the areas that companies have to be aware of when entering a new market for the first time. I have discussed Mexico extensively in an earlier blog post and future blog posts I will cover the other three MINT countries in more detail. So in summary, an interesting time for Western companies, should they invest in BRICs or MINTs ?, as I have a sweet tooth I think I know where my money would go!